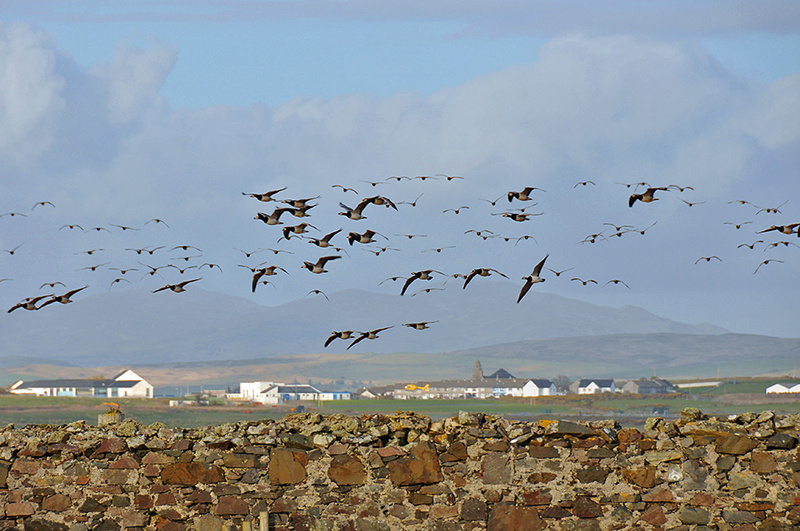 Some Barnacle Geese passing Gartbreck near Bowmore in April 2014. Most of the geese have left by that time of year, these were some of the last remaining ones, soon to leave as well. The view is from Gartbreck over to Bowmore (you can see the Round Church’s tower and roof towards the right). May be the geese were spooked by the yellow helicopter landing near Bowmore? This entry was posted in Landscape, New Post, Sunny Weather, Village, Wildlife and tagged Barnacle Geese, Bowmore, Gartbreck, Islay by Armin Grewe. Bookmark the permalink.